Quality Air Heating and Air Conditioning > Articles > Air Conditioning > Is My Air Conditioner Running too Noisily? Is My Air Conditioner Running too Noisily? During the hottest time of the year, you really need your air conditioner to be working at peak performance and efficiency levels. If this is the not the case, you are going to struggle to enjoy the great cooling performance that we know you enjoy. Fortunately for you, we are here not only to keep your AC in fine working condition, but also to get it back on track if anything should go wrong. The worst thing that you can do for your home cooling system is to convince yourself that everything is fine when something out of the ordinary is happening. 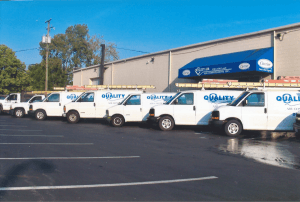 If your AC is operating at a higher noise level than is normal, for instance, you may be in need of air conditioning repairs in Columbus, OH. Let us know if you are hearing anything unusual. Screeching is one of the most common sounds that homeowners may hear coming from their air conditioning systems. The fact that it is common, though, doesn’t mean that it is of no concern. It could mean that you have a damaged belt in your system, or that your motor bearings are in trouble. It’s possible that you may need some lubricant added to the system, but it could also be indicative of a more serious issue. Banging, clanging, thumping, etc. are also common sounds that can indicate that problems are afoot with your home cooling system. Motor mounts may have worked loose, or the blower could be misaligned. Because such sounds generally indicate that a component has worked loose, it’s important that you have the issue resolved before continuing to use your system, lest you do further damage. Clicking sounds may not seem like a big deal, especially when compared to loud banging, but they are definitely cause for concern. This could mean that you have an electrical problem on your hands, which in turn could render your system either inoperable, or even unsafe to use. This could be a defective relay, or a failing capacitor. Call Quality Air Heating and Air Conditioning for prompt air conditioning repairs.